Only four years after the Regents Canal was opened a bill was presented to Parliament to authorise the construction of a link to the River Lee Navigation. The River Lea, which rises in the Chiltern Hills and flows into the Thames at Bow Creek, always formed something of an obstacle to travellers and carriers. A crossing point may have existed long before the first century AD but archaeologists have revealed the definite existence of a Roman settlement on the road between London with Colchester. In the medieval period a triple arched, stone bridge was constructed over the Lea at Bow, because, so the story goes, Queen Matilda, wife of Henry the First, was soaked in an unfortunate incident when she was crossing the river. This made a road journey safer at that point but the Lea continued to present problems because the river split into several meandering channels in its lower reaches. These channels, which were utilised as a power source for water mills, became known as the Bow Back Rivers. During the C18th a great deal of work was undertaken in improving the lower reaches of the Lea but the opening of the Regents Canal provided an opportunity to providing an alternative route to and from the Thames from the Lea Valley. The River Lee Navigation was created to improve navigation in the Bow Back Rivers area but there appears to be no definitive answer as to why it is not called the River Lea Navigation. 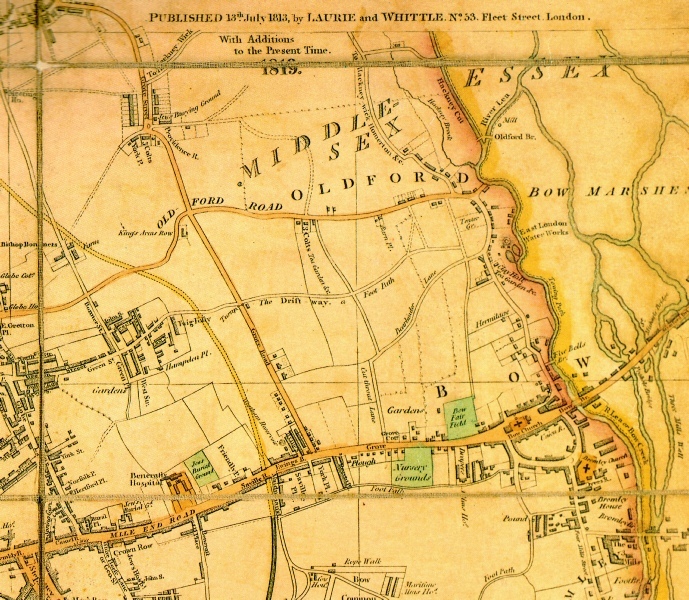 The map shown to the right (1) is part of one published by Laurie and Whittle in 1813 and updated in 1819. The Regents Canal was at that time nearing completion, the line to be excavated being shown in yellow. Note the meandering channels in Bow Marshes. The Gardens would have been market gardens producing food for the rapidly growing population of London, but the Tea Gardens did not grow tea. They were places of recreation where tea and other refreshments would have been sold. From the start the Hertford Union was not a consistent commercial success but eventually much of the south bank, and, to a lesser extent, parts of the north bank, were lined with all kinds of industrial enterprises. These were well served by the waterway. A huge amount of timber, sometimes brought thousands of miles across the oceans, eventually ended up in the saw mills and veneer works along the canal, which was often called Duckett’s Cut or simply the Cut (a name which I will now mostly use). Today the Cut is unrestrictedly fed by water from the Regents Canal, but initially the Regents Canal Company ensured that there would be no unauthorised encroachment on its resources. Canal companies were, understandably, very jealous of their water supplies and the parliamentary Act under which the Cut was built stipulated the ‘summit level of this canal is to be 6 inches above the top water mark of the Regents Canal’. Consequently, even though Duckett’s canal was only a little over a mile long it originally had its own small reservoir and a steam engine was used to pump water from the lower pound back to the upper level. Walking along the towpath will take you past Bow Wharf (2) on the opposite bank, where a series of enterprises are housed in either wooden units or industrial buildings converted for leisure and exercise use. The residences by the towpath, which overlook the canal and Bow Wharf, were constructed on a strip of land between the canal and the backs of a terrace of houses that were built in the nineteenth century. These were also designed to take in the view. In this case a view of Victoria Park. The park was built a few years after the Cut, and as the Regent’s Canal defined the western border for James Pennethorne’s park plans so the Cut defined a good deal of the southern perimeter. These houses were, and still are, attractive, and one was, for a time, the home of Israel Zangwill. Israel Zangwill was the son of Jewish immigrants from Latvia and Poland, which at that time were within the Czarist Empire. He was born, in 1864, in the East End of London and considered himself a ‘Jewish Cockney’. After working as a teacher he turned to journalism and soon achieved success as a novelist and playwright drawing heavily on his youthful experiences in Whitechapel and Spitalfields. He found international fame with the publication of ‘Children of the Ghetto’ in 1892. Only a couple of miles from Whitechapel, life in the relatively grand house facing Victoria Park must have been something of a contrast to the conditions which faced most East Enders of the period, but Zangwill never departed emotionally from his roots. No doubt he would have walked over Grove Road bridge on some days and looked down on the activity in the Cut, which would have been a constant reminder of how the drive of late Victorian industrialisation depended on long hours of grinding, heavy, manual labour. Always politically active Zangwill gave support to those whom he considered oppressed and exploited. He was, for example, a founding member of the ‘Men's League for Women's Suffrage’. If you want to see the blue plaque that marks Zangwill’s residence walk under Grove Road bridge, climb the steps on the left and then cross the zebra crossing. Turn right and follow the footpath round to the left to 288 Old Ford Road. It is not only a commercial gym and a banqueting suit which have utilised the old industrial buildings on the Cut. As you pass under Grove Road bridge, hard by a modern residential development on the south bank, you will see a derelict redbrick building, with smashed glass panes in the windows frames. This abuts another, in a better state of repair, which has CHN on the side (3). In their heyday these buildings were linked to the veneer trade. CHN stood for CHN Veneers, which had been established by an entrepreneur named Morris Cohen in the 1930s. Perhaps surprisingly the factory was expanded and rebuilt in the middle of the second world war, but this was to facilitate the production of war material, including propellers and plywood for the de Havilland Mosquito, a fast twin-engined aircraft that was constructed almost entirely of wood. When the war was over veneer production continued, in what was called the Chisenhale Works, until the 1970s. At that time there was something of a revival of brewing in London and for a period after the closure of CHN barrels of Godson’s Black Horse bitter might have been seen being loaded into barges adjacent to the defunct factory. The brewery did not stay long, however, and in the 1980s the Chisenhale Works became an arts centre with studios for dancers and artists. Well known just as the Chisenhale, it is still used in this way today. It is impossible to miss the bulk of the old CHN factory, but easy to overlook a series of tiny sculptures on the towpath wall right opposite. They are by Jonesy, a bronze caster who works from a studio in Tower Hamlets. His miniature works may also be seen on the Regents Canal and in other parts of the East End too. The artist’s bronze works sometimes allude to environmental causes - fracking being a particular target - but often just seem rather haunting in their own right (4). In any event the sculptures are always intriguing and thought provoking. Walking on a little further will take you under Skew bridge, so called because that is exactly what it is - a bridge that carries Old Ford Road obliquely across the canal. 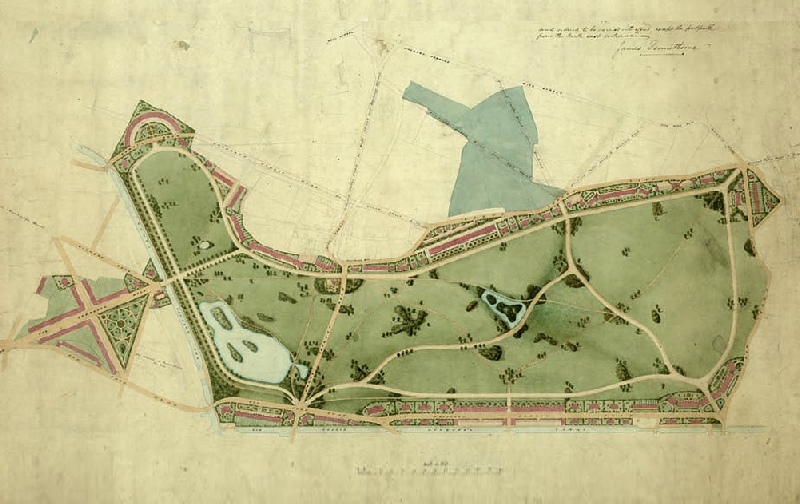 It was shown like this in James Pennethorne’s plan of Victoria Park (5) but the awkward skew predates the creation of the park (the original plan is kept in the National Archives at Kew). Passing under Skew bridge will bring you to the boundary of ‘Vicky’ park. This, eastern, part was once home to the local Lido, an outdoor pool which, sadly, was demolished over twenty years ago. The Forum (or For ‘em and Agin ‘em as it was sometimes known), a kind of East End Speaker’s Corner, was also located in this area but has long fallen into disuse. Rather than bricks and mortar the towpath is now bounded by railings, which are of quite some vintage. They clearly escaped the large scale metal collections that took place in the early years of the Second World War, when there was a great drive to turn scrap iron into munitions. At first the surrender of railings which, according to recycling experts, had a special value in the manufacture of ships’ cables, chains and other fittings, was voluntary and many London boroughs offered those in public ownership. Some commentators applauded this. The influential left-wing writer and broadcaster J.B. Priestly, for example, considered railings as ugly thickets of iron, observing that London parks had miles of railings around them. He also complained about The little gardens in the squares, which might be open and pleasant, are severely railed in, as if there were tigers lurking in their bushes. Tigers or not compulsion soon arrived. As the need for scrap metal grew requisitioning became necessary and in October 1941 many local newspapers informed their readers that unless railings were needed for safety reasons or had special artistic merit or of historic then they could be legally taken away. Passions ran high about the change and the Daily Mirror had a report about one irate owner marching into the office of a borough surveyor, slamming down a pistol and exclaiming ‘That is for the bloke who is going to take my railings’. I think we can safely say he lost his railings anyway. The canal side railings of Victoria Park were clearly needed for safety reasons even if they were not regarded as having artistic or historic merit and so survived. They were cut by neither oxy-acetylene torch nor hacksaw but over the post-war years many were gradually divided and, at some points, actually encased by trees and even though some of the trees have been cut down the struggle between nature and fabricated iron clearly goes on (6). Where repairs or replacement of the old railings has taken place the original spear head or sharp-point tops have been replaced by modern flat tops, for which anyone who has tried to climb over them is no doubt grateful. Although Skew bridge has, of necessity, been strengthened over the years and must bear little resemblance to the original construction, the next one on the line of the Cut is a scheduled ancient monument. Three Colts Bridge (7) dates from 1830, the year when the waterway was opened. The elegant central metal deck, which now carries foot and pedal power traffic to the park from Gunmakers Lane, was probably brought to the works in pieces and then assembled on site. Go on to the bridge and look over the side and you can still see the nuts used when bolting on the parapet. It was one of seven similar bridges that initially spanned the canal. The bridge plaque (8) itself is something of an historical artefact too as it dates from the period when the Liberals Democrats were in power in Tower Hamlets. During those eight years, between 1986 and 1994, the borough was divided into seven Neighbourhoods, one of which was Bow and which developed its own heritage trail. Gunmakers Lane is a reminder of an industry that was established on adjacent land in 1866. 1866 was a significant date in the development of small arms. Much of the credit for the victory of the Prussian Army over the Austrians in that year was due to the use of the needle guns, a kind of breach loading rifle far superior to the old-fashioned muzzle loader. For many years this type of weapon was commemorated in a nearby pub on Roman Road, called the Needle Gun. Here, presumably, knowledgeable workers could drink as they talked shop and gave their opinions on the latest development in armaments. No heritage plaque ever graced the front of the Needle Gun (although the building, which now houses remains) but close to the junction of Roman Road and Gunmakers Lane is one which commemorates another pub, The Gunmakers Arms, although it is on the wall of a modern block of flats. The Gunmakers Arms was no longer being used as a pub when, in 1915, it was bought by the pacifist Suffragette leader Sylvia Pankhurst and renamed the Mother’s Arms. There was then a radical change of use as it became a kind of welfare centre, the East London Federation of Suffragettes setting up a baby clinic, staffed by trained nurses and a crèche. The childcare provision was of immense benefit to women who could then take the opportunity to take paid employment, meagre though the wages might be. Click on button to the left to find out more about the Suffragettes in this part of the East End. The arms factory itself, which mostly produced rifles, was owned by the London Small Arms Company. Its main competitor was based in Birmingham. Although the quality of the LSA guns were prized, the company was never able to complete in quantity or to diversify because of restriction on space. Consequently, there are no LSA bicycles or fabulous cafe racers like the Birmingham Small Arms Gold Star. Around the time LSA was wound up in the 1930s BSA was progressing to be the largest producer of motorcycles in the world. Indeed the company was arguably the largest company on the globe at one stage but this did not stop it from going bust in the early 70s. It was not too big to fail. One small enterprise that was apparently swept away when the Cut was developed was the Three Colts Tea Garden. All tea gardens in the area would have been an easy walk from the more developed parts of east London such as Spitalfields and their loss to encroaching industrialisation keenly felt. But young people need somewhere to go and enjoy themselves and Victoria Park would have been some compensation. It still is, in a way. In the 70s and 80s free music events with a political base (building on a tradition of demonstrations in the park and other radical East End movements) such as the 1978 Anti-Nazi League or the 1985 Jumping and Jiving for Jobs concerts took place here. Now commercial concerts dominate the scene. As is the case with municipal parks all over the country the revenue raised from commercial use helps maintain the facility at a time of increasing financial pressure. Nonetheless, such use irritates some local families, particularly those without access to a garden, who may loose the use of a substantial part of the park over an extended period after the perimeter hoarding goes up (9). Beyond Three Colts Bridge the Cut continues in its dead straight line to the point where boats must begin to descend towards the River Lee Navigation. Continuing along the towpath you will soon see, if you look right, a piece of sculpture that appears to celebrate the horses and barges which worked the Cut when the towpath really was used for towing (10). It is a little more complicated than that. It is called The Barge of Invisible Memories. A notice, which has now disappeared, explained that the sculpture was a symbolic representation of the history of the East End. Should you like to read the full text of what the notice said click on the yellow button to the left. The further the Cut gets from the junction the more it seems to take on a separate identity to the Regents Canal even though they have been run by the same company or organisation since the 1850s. This is not only expressed in the iron parapet of Three Colts Bridge. The overhanging trees of Victoria Park add charm to the towpath and moorings as do the locks, lock keepers cottage and a second fine bridge at what is officially called Hertford Union Top Lock. A new canal has just been opened at the eastern part of London, which is intended to form a junction between the Regent’s canal and the Lea river. It is called the Lea Union canal and has been formed at the expense of an individual, Sir George Duckett. The Dublin Evening Packet and Correspondent was a little more forthcoming about the advantages of using the new canal, drawing the attention of its readers to the fact that it would prevent the inconvenience felt in navigating in the neap-tide on the lower Lea. There would doubtless have been some well-wishers watching as the first toll-paying boats passed through the new canal, amongst them being shareholders in the Regents Canal which stood to gain if traders began to opt to use the ‘Ducketts and Regents’ route to and from the Thames rather than continuing to ship via the Lea and the Limehouse Cut. Steps were taken to encourage these traders to use the new route through adverts in the press. It was made clear that the general conditions of transport of various bulky commodities, including coal, would follow established practices on the Lea and that ‘no charge would be made for the return of empty sacks’. Once you arrive at the Hertford Union Top lock note the bas-relief on the cottage (11). The clog-wearing blacksmith is hard at work but does the horse look a little apprehensive to you? And spy the fish from which the globe light emerges. There is another Bow Heritage Trail plaque here (by the footpath that runs into Victoria Park) which indicates the bridge, another of the original seven, was known as the Homerton Footpath bridge. The lock itself has a fall of over 6 feet. Stonework on the abutment has been well worn not only by tow ropes, but also by generations of passing bargees and boaters pushing the balance beams to open the lock gates (12). Like the original bridges cast iron was used to manufacture these balance beams (13), which were known as levers when first installed. As a type they are are now quite rare. Once under the bridge it is a short walk to the Middle lock and this is probably the quietist part of the Cut. The water in the adjacent pound may sometimes seem mirror-like and at present relatively few walkers, joggers or cyclists use the towpath, certainly when compared with, say, the Regents Canal towpath near Broadway Market. One problem in maintaining the towpath here has been the destructive pressure of tree roots. A reinforced concrete wall runs towards the lock, unattractive for the most part but, where steel mesh has been placed in front of it, faces peer through fabric (14). The faces look rather tortured but then so would yours if you spent night and day worrying what would happen if a wall behind you gave way. Beyond the faces smoother concrete panels sometimes sports fine murals, like this one of an eel (15). Close to the Middle lock is an entrance to the Growing Concerns Garden Centre. The enterprise clearly makes substantial efforts to improve the look of the canal with towpath-side plantings, which add colour in spring and summer and interest all the year round. If you live in the area and have a garden, patio or even a window box why not consider paying a visit? The towpath descends quite steeply by the side of the Middle lock, which has a fall of almost nine feet, and then turns sharply under Wick Lane bridge so take good care on the blind corner. Compared with the section through which you have just walked the next part of the canal might seem more hazardous, especially during rush hour, when, partly as a result of being designated as part of the National Cycle Network, the towpath is used by many commuting cyclists. The confluence of the ordinary towpath and that designated to be part of the National Cycle Network is at the bottom of the ramp which leads to Wick Lane. Close by the bottom of the ramp you might see recycled water feeding into the Cut. This has been used to cool the high voltage electricity cables that run under the towpath. When the Cut was originally opened water was also recycled but in that case to counter the water loss that was an inevitable consequence of the conventional locking system. A ‘Thirty five Horses Power’ steam engine was employed for pumping the water, which was returned to the upper level, but I am not quite sure just where the engine house was. It must have been as fine a sight as the bridges though, especially when new. It was built of brick with a cast iron roof that was sheathed in sheet copper which would have glinted in the sun. Unless, of course, the sun was obscured by smoke from the fire box. Until recently a pub stood at the top of the ramp. It was last known as the Top O’ The Morning and had a plaque (16)(now affixed to a new wall) on the front that commemorated an infamous murder, evidently the first ever committed on the British railway network. This took place when the pub was called The Mitford Castle. Today the pub and kitchen which occupies the same site is called the Muller and Briggs. A bridge carrying the North London Railway once ran over the Cut here. Sometime after 10pm on July 9th 1864 an engine driver stopped his locomotive close by the canal after he spotted a suspicious object lying between the tracks. On investigation the train’s stoker and guard found a man who was both severely injured and unconscious. After the alarm was raised the man, who turned out to be a senior bank employee called Biggs, was carried to the Mitford Castle but his injuries, which it appears were caused by an attack and having been thrown from the train, were so grave that he died within a day or so. It quickly became apparent that Biggs had been the victim of a robbery and subsequent detective work soon pointed the finger at a Franz Muller who had departed for the United States by sailing ship on July 15th. Had the only way to pursue the suspect been on another sailing ship it is possible that Muller would never have been intercepted but such was the speed and efficiency of transatlantic steamers that on arriving in New York he was met by two London police officers who had been there for many days. A watch belonging to Mr Biggs was found on Muller when his trunk was searched and he was subsequently extradited. Back in London he was tried, found guilty and executed. ‘Mr Briggs’ Hat’ by Kate Colquhoun gives a fascinating and detailed account of the case. If it were not for Victoria Park it is quite possible there would be none of the original cast iron bridges left on the Cut, for, although suitable for carriages, they could not have carried the motor traffic generated by the industry and residential developments which grew up around it. Continuing beyond the ‘ramp junction’ will take you under two reinforced concrete bridges which carry heavy traffic of all descriptions to and from east London and the Blackwall tunnel. There is a gap between them (17) that lets in light, which is certainly welcome on this gloomy stretch. Until recently, once beyond the bridge, the Cut seemed even more rural than before but this was partly due to the fact that it was not overlooked from the south bank by any developments, residential or otherwise (18). That has now changed. There is considerable concern amongst many artists and craftspeople who work in the adjacent area, which is called Fish Island, that the re-developments which are taking place will, for one reason or another, drive them out. On one of the construction hoardings was an impression of what the completed residential area, now renamed Fish Island Village, would look like when viewed from the towpath (19). Clearly, no point in hanging about waiting for the smell of woodsmoke from that moored boat. The Bottom Lock, the third and last lock of the Cut, is only a short distance from the large bridges. It has a much lower fall, not even four feet, than either the Top or Middle locks and the short gates look rather curious (20) but the striking thing about this part of the canal are the nearby walls, which have become, essentially, display boards for ‘spray painted graffiti visuals’. I borrowed that description from the website of Silent Hobo who, in the early summer of 2017 produced a mural on the largest of the flank walls. I didn’t manage to get a picture of it before it was partly painted over but, even at that stage, most of the work was clearly visible. However, over the next couple of weeks, most of the mural was obliterated by the work of other spray can specialists and nothing can be seen of it today. The wall that runs parallel to the lock pound has also been subject to endless overpainting, but I was still disappointed when the man on the red telephone disappeared (21). The artists (who shouldn’t be confused with those anti-social sprayers who aimlessly disfigure the lock gates and bridges) who work here seem to accept their creations will be transient, but I wonder what will happen to these walls as, surely, it is only a matter of time before another demolition team moves in. Is there any chance of them being preserved - something of a counterpoint perhaps, to what is going on all around? Click the button on the left to see the gradual disappearance of Silent Hobo’s mural and the work of other graffiti artists too. A few yards beyond the Bottom Lock the towpath becomes a little wider. There is another metal bridge at the end of this stretch (22). I’m afraid three of the trees between the towpath and the canal shown in the photo have recently been cut down, which seems a pity. The bridge remains and although it doesn’t date from the 1820s it has its own attraction. At the top of the access steps notices are sometimes posted about forthcoming events. One posted in October 2018 (23) indicated that it was not just artists and craftspeople who felt excluded from meaningful involvement in the way the area has been developed. If you are tempted to cross the bridge on a frosty morning take care. It can be rather slippy underfoot. Planning permission has already been applied for to replace the bridge and open a new access route between Roach Road and White Post Lane. Let’s hope the new bridge will be built with a less tricky surface and thought given to replacing the cut down trees too. Over the past few years the planning departments responsible for the whole area of the lower Lea valley have had plenty to do because considerable post-Olympic residential developments have either been built already or are in the pipeline. It is estimated that, over the next 20 years approximately 20,000 private residential units will be built here. The impact on commuting towpath traffic on both the Hertford Union and the Regents canals is likely to be considerable too and it is to be hoped the relevant authorities are giving due consideration to ensuring the safety of all users on what is essentially quite a narrow path. You will now be near the end of the Cut and if you feel in need of refreshment you might think of calling in at the White Post Cafe, the entrance to which is a little beyond the ramp that runs up to the metal bridge. If not continue a few more yards and you will arrive at the junction with the navigation. You might see a number of small metal sculptures here (24), which, like the London Stadium across the water (25), date from the 2012. You might also see a pair of mute swans. I doubt if anyone knows how long swans have lived on the Lee but if you see their gravitas and stately progress it is not difficult to imagine why these birds are often associated with royalty. At one point, in the medieval period, the Crown claimed ownership of all swans in the kingdom, and even today, the Queen has special rights to some of the swans on certain stretches of the River Thames. At this point the excursion ends. Should you wish to explore the River Lee Navigation, either north or south, then follow the towpath round, turn right and cross the bridge and go down to the towpath. This area has become quite popular as a social venue over the past year or so and is one place where the Village Butty has moored. When the photo on the right was taken (26) snow obscured what was on offer, but if you would like to find out more about the Village Butty click on the button to the left. By going south from here it is possible to reach Limehouse Basin via Three Mills and the Limehouse Cut towpath. However, if you want to return to the Regents Canal (and don’t wish to simply turn round and walk back the way you came) you could use public transport. Instead of turning right at the bridge, turn left and walk down to the bus stop. You can catch a 339 here which will drop you at St Barnabas Church (stop Y), close to the junction of Grove Road and Roman Road. When you alight walk back towards the church, cross Grove Road at the lights and continue east along Roman Road until you reach Twig Folly bridge, which crosses the Regents Canal just south of the entrance to Duckett’s Cut. Steps will take you back to the towpath and you may continue your walk along the Regents to Limehouse (click the button on the below to go to the Bethnal Green to Limehouse section).